H. Rick Bamman - hbamman@shawmedia.com Woodstock resident Michelle Gehris cast her ballot during early voting Monday, Feb. 29, at the McHenry County Administration building in Woodstock. 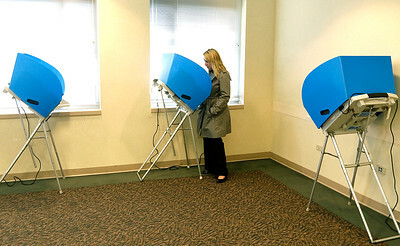 The two-week early voting period before the March 15 primary began Monday at 10 locations throughout McHenry County. Residents can vote at any of the locations regardless of their address through Monday, March 14. H. Rick Bamman - hbamman@shawmedia.com McHenry County Election judges Donna Rhodes (left) and Rebecca Evans check electronic voter information during early voting at the McHenry County Administration building in Woodstock on Monday, Feb. 29, 2016. 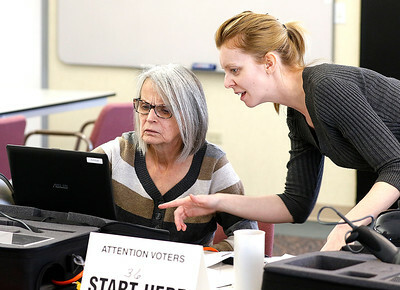 McHenry County Election judges Donna Rhodes (left) and Rebecca Evans check electronic voter information during early voting at the McHenry County Administration building in Woodstock on Monday, Feb. 29, 2016.